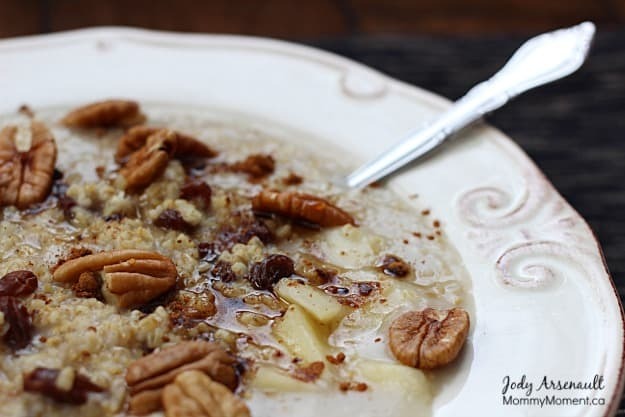 This Maple-Pecan Porridge is a common breakfast dish in our home. My whole family loves it and I love that my girls are having a healthy, filling breakfast before they head to school. 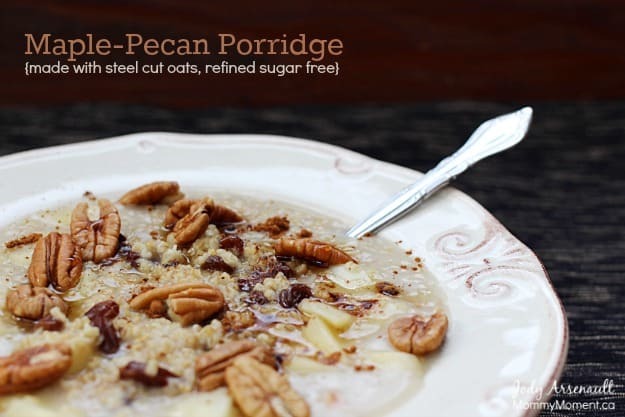 This maple-pecan porridge is made with steel cut oats and is refined sugar free. It is a filling breakfast that tastes like a treat. In a saucepan, bring water to a boil*. Add the steel cut oats and reduce heat to medium. Add the chopped apple and stir again. Cook for 25 minutes (or 10 -12 minutes if using the tip below*) uncovered or until it is thickened. Some other breakfast recipes you may enjoy: Baked Oatmeal, Apple Cinnamon Oatmeal, Coconut Almond Quinoa Breakfast Bake and Warm Quinoa and Almond Breakfast. Do you love pecans? Here are some pecan inspired recipes: Pecan Chocolate Banana Bites, Pecan Coffee Cake Muffins, Chocolate Pecan Tarts, Easy Butter Pecan Tarts, Pecan Haystacks, Chocolate Peanut Butter Turtles, Sinfully Good Southern Pecan Pie, Chocolate Jam Pecan Bars. Thank-you! It tastes delicious too. This looks like a delicious and hearty breakfast! We love porridge too! Thanks, it is so wonderful on cold winter mornings! Thanks Angie – My girls love when I make this for breakfast, it’s a family favorite for sure! Love this! Most of my days start with porridge, I’m gonna try this! oh my! this sounds fabulous! I cant wait to try this! This looks so delicious! I have loved following all your food posts! So yum! Oh my, that looks delicious. Love maple syrup and adding pecans , what a great idea! Thanks for sharing! Sounds really good! Will have to make up a batch of it this weekend to try it out! Ok, I have to try this – well except the raisins… I hate cooked raisin, I find them mushy. The REST of that sounds so good for breaky! Or a day when you need breaky for supper. this sounds super! can it be portioned out for multiple brekkies? It would be great at work. I love maple syrup and pecans! Thanks for sharing a way to combine then in a tasty and healthy way! This looks like a hearty breakfast! This oatmeal would make a lovely weekend breakfast. I am also trying to eat healthier. Your recipe for Maple-Pecan porridge sounds really good. I look forward to trying it. oh! YUMMY!!YUMMY!!YUMMY!! That looks so gorgeous! I have to try this!